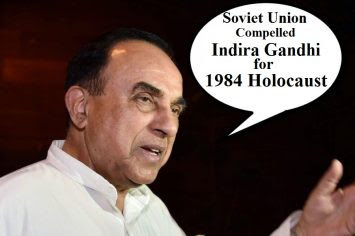 Posted: 19 Jun 2018 08:57 AM PDT AMRITSAR SAHIB—In an interview with a mainstream news channel named News18, the BJP parliamentarian Subramanian Swami has made major revelations about the June-1984 holocaust committed by the then Prime Minister Indira Gandhi. He has revealed the Soviet Union was hyper to crush Sikh movement in Punjab as the religious preachment by Sant Jarnail Singh Ji Khalsa Bhindranwale had cornered communist movement in Punjab. He further said that the Indian Communist leaders like Harkishan Singh Surjit were continuously provoking the Soviet Union to pressurize Indira Gandhi to take action against Sant Bhindranwale. Recalling one of his meetings with Indira Gandhi, he said that he had approached Indira Gandhi when he got apprised of her plan of military attack on Sri Harmandir Sahib. “When I tried to convince her, she asked me to talk to Rajiv Gandhi as she knew that he was my friend” he said while adding that in actual Sonia Gandhi was favoring the Soviet Union’s pressure to carry out military operation on Sri Harmandir Sahib. Interestingly, Subramanian Swami said that he doesn’t say the Sikhs are part of Hindu community but he believes that Sikhs are courage of Hindu community and the Hindu community can’t survive without Sikhs. Subramanian Swami also said that the barbaric carnage of Sikhs carried out in November-1984 should be declared Sikh Genocide officially by the Indian government.